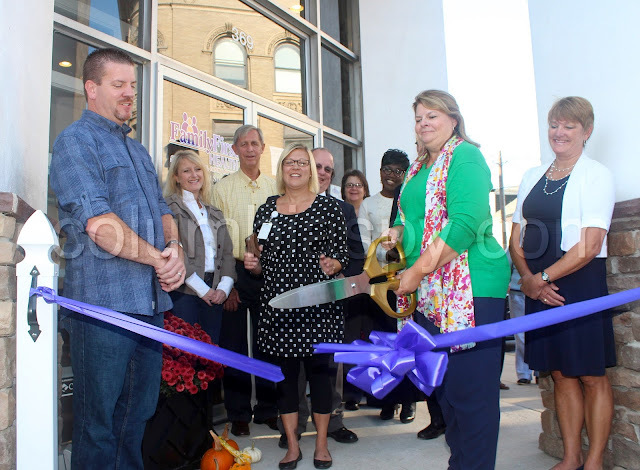 Don and Becky Murphy (first and second on left) watch Jenny Englerth, Family First CEO, cut the ribbon at Thursday's ceremony. The Family First Health staff held an open house and ribbon-cutting on Thursday afternoon. Doors will open to patients for appointments on Tuesday, October 11. Family First Health, a federally qualified health center, will open its doors to patients in Columbia on Monday, October 11. The health center, located at 369 Locust Street, will be the sixth location for Family First Health, which operates five other health center sites in Adams and York counties. The building is owned by Don and Becky Murphy and is the former home of the Columbia National Bank. A community assessment in 2014 found that while health services in Columbia were available for those with insurance, affordable and accessible care was difficult to find for those without insurance. The assessment also identified a lack of mental health services and noted that individuals may not take prescribed medications due to cost. Led by Dr. Marie Kellett, Family First Health – the Columbia Center offers family medicine and participates in most insurance plans, and also offers integrated, on-site behavioral health services. A sliding-fee scale based on family size and income is offered to those who are uninsured. Founded in 1970, Family First Health is a non-profit, federally qualified health center dedicated to increasing access to affordable, quality health care. With sites in York, Hannah Penn Middle School, Lewisberry, Hanover, Gettysburg and Columbia, Family First Health provides a broad range of primary health, dental care and social services to insured, uninsured and underinsured patients with the goal of improving the health of our communities as a whole. For more information, visit www.familyfirsthealth.org. Se habla español. Welcome to Columbia and best wishes.